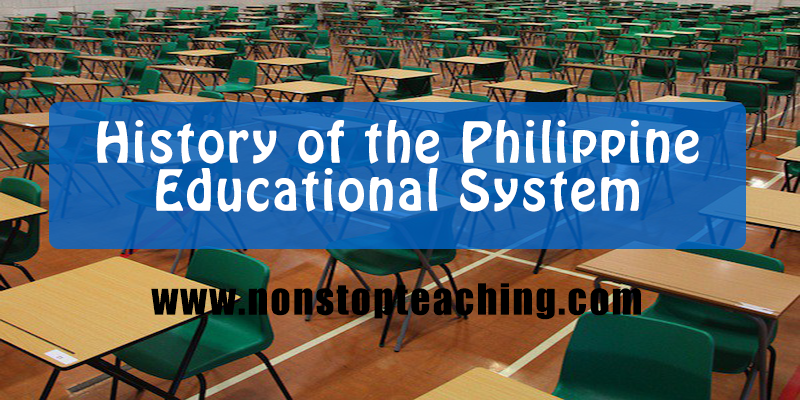 In this article, we will see more about how the educational system of the Philippines came into existence, starting from the early settlers up to the present. To deal with this, we will be tracking four main stages of history which resulted in significant changes in the educational system. Firstly, education from Early Filipinos will be discussed followed by the Spanish Period then the American Period. Furthermore, we discuss the changes during the Japanese Occupation and finally the educational system in the Present Period. The evolution of education in the Philippines has already been observed from the early settlers to today. In the country education has high priority and it is of national importance that education is maintained since it is the primary avenue for upward social and economic mobility. Before becoming stable, the country’s educational system went through several stages of development. The economic situation during the pre-colonial times was the great contributor and a major factor in the system of education in the Philippines. Primitive Communal to Asiatic feudalism were the types of society present before Spanish colonization. With their practical and subsistent mode of production they had to provide education that was plain and simple. The medium of instruction used was Alibata, the native alphabet. The educators or the teachers during the pre-colonial era were the Babaylan and the Katalonan. Gifted with wisdom and knowledge on spirituality and the system of running their own society, they were respected by the people of the society Therefore, the type of education that was taught was one of beliefs and traditions. However, since there was insufficient scientific learning, they lacked efficient means of economic production. Education was truly valued by the early Filipinos. The fathers trained their sons in how to hunt and other means of maintaining a livelihood. On the other hand, the mothers were in charge of their girls and instructing on household chores. The purpose of this type of education was to prepare both boys and girls to become good husbands and wives in the future. Both Filipino men and women knew how to read and write using their own alphabet called alibata. It was composed of 17 symbols each representing the letters of the alphabet. The symbols contained three vowels and the rest were consonants. Communities were Muslim, similar to those on Mindanao, and education was proliferated through the religion of Islam. The Imam or Ulema were the declared teachers. The children were taught how to read, write and comprehend Arabic by using the Koran as their holy book. To sum up, ‘informal’ and ‘unstructured’ are the words best used to describe the education in the Philippines during the pre-Spanish era. The type of education was not institutionalized and separate institutions for education were not in place. Specialization in education also did not exist. Compared with the system of the early settlers, during the pre-Spanish time the system changed into a formal system. The first Christian school built in the Philippines was mandated by the Augustinians and established in Cebu in 1565. The establishment of schools from the primary level to the tertiary level education came about all because of the religious congregations. Christian doctrines were the main focus of these schools and schools for boys and girls were separate. However, only wealthy Filipinos or the Illustrados were accommodated by the schools. More negative effects were brought about by colonial education for the Filipinos. The Spanish authorities in the Philippines were mandated to educate the natives, to teach them how to read and write, and to learn Spanish based on King Philip II’s Law of the Indies (Leyes de Indias). However, given the realities of the time, the last order was quite impossible. First, the number of Spaniards in the Archipelago was limited so the teaching of Spanish at that time was minimal. Next, the Philippines was inhabited by diverse tribes with different languages all with unique customs and religions. Then, the topography of the country - the seas, the mountain ranges, the lush virgin forests and the absence of enough good roads - made travel and communication difficult during these years. Faced with these problems, the friars - the vanguard of evangelization and education – found an alternative which was to learn the native languages first so that they could use them as tools to evangelize and teach the natives in the missionary schools. Nevertheless, Spanish was also taught to those who were interested. With the first movable printing press in the country introduced by Spaniard, Tomas Pinpin, the Prince of Filipino printers, made sure he published a book on how to learn Spanish. The archives of some of the published books during the Spanish era, such as the Spanish-Chinese dictionaries, are kept at the University of Santo Tomas. The public school system in the Philippines was born in 1863, with the passage of the Education Reform Act in the Spanish Courts. Due to the compulsory education of Filipino children, separate schools for boys and girls were established in every pueblo†. The law also implemented the training of both male and female teachers after the establishment of the Escuela Normal. The clergy or the friars maintained the order in the educational system during these times. They owned different schools in the country, ranging from the primary level to the tertiary levels of education. The sole responsibility of the missionaries, aside from teaching Christianity, was to maintain the rules and regulations imposed on the students. In addition, teaching and controlling them was also in their hands. As the early part of the seventeenth century approached, there was already a system laid down for the secondary and tertiary education, but it was not directed only by Christian doctrines. As the priest and monks worked together with the civil authorities, they also began to create a network of primary schools whereby both religious and secular subjects were taught. Ever since the Spanish colonial government adopted the program of compulsory elementary education in 1863, the education became free to all children between the ages of seven and 13. Having such a fulfilling program, the Philippines were already ahead of most other neighboring Asian colonies in general education (Gunnar Myrdal 1968). Although a systematic and institutionalized kind of education was established, unfortunately there was still inequality in attaining education. The system of education familiarized by the Filipinos was religious and patriarchal. People were also taught that social mobility was achieved through education, but sadly this manifested itself in social inequality and female subordination. The higher priority for educational attainment was placed on men rather than on women. Although the Mestizos and wealthy people enjoyed the privileges of entering prestigious schools, there were women only vocational schools for women. However, most women were denied their rights to education due to the patriarchal belief that women should stay only at home. With regard to higher education, the students graduated with a Bachelor of Arts (Bachiller en Artes) degree. The Jesuits established “Colegio de San Ignacio”, the first college schools for the boys in Manila in 1580. This was followed by another university, “Colegio de San Idelfonso” in Cebu in 1595. It was in 1589 when the government entrusted the “Escuela Pia” to the Jesuits, later this was called “Ateneo de Municipal” which is now the famous Ateneo de Manila University. “Colegio de San Jose” was also established in the early 1600s by the friars (de la Costa, Horacio 1967). After the Jesuits, the Dominicans also claimed their reputation as they established one of the best universities in the Philippines, the University of Santo Tomas which was opened in 1611. Around 1630, another university was set up built especially for orphaned boys called the “San Juan de Letran”. Compared with the boys, it took a little time to establish schools and colleges for girls. In 1589, “Colegio de Santa Potenciana” was opened for girls; this was the first school and college for girls. Following the birth of the first school for women, Colegio de Santa Isabel opened in 1632. The religious congregations instituted “beaterio”. The sole purpose of this was to provide education for orphaned girls who could not afford to educate themselves. The lessons taught were basically about household tasks such as cooking, embroidery-making, sewing and others skills necessary for good housekeeping. Even though many universities and schools institutions were established, Science and Mathematics were not much taught to the students; the missionaries greatly emphasized teaching the Christine doctrines, the reading of Spanish books and a bit of the relevant native language. The Decree of Education in 1863 established the first ever educational system in the Philippines. It required the government to provide school institutions for boys and girls in every town. Given the situation, the Spanish schools started accepting Filipino students. It was during this time that the intellectual Filipinos emerged. This also brought about the establishment of the Normal Schools which gave more opportunity to the Filipinos to attain a sound education. The Normal Schools offered a three-year teacher-lead education at the primary level. Similar to the Spaniards, the Americans brought many cultural and traditional changes to the country during their 45 years of colonization. Even today, these strong influences can still be seen in the lifestyle of the Filipinos. With their motive to spread their cultural values, specifically the English language to the Filipino people, education became a very important issue for the United States’ colonial governments and they used it as a tool to fulfill their visions. Every child from age seven was obliged to register at the nearest school. School supplies were provided to the students for free. During the American period levels of education were divided into three. Firstly, the “elementary” level composed of four primary years and three intermediate years. Next, the “secondary” or high school level consisted of four years, and finally, the “college” or tertiary level. Unlike during the Spanish period, religion was not part of the school curriculum. If students excelled academically they were given a chance to continue their studies and to pursue their expertise in their chosen fields or professions in the United States. “Scholar” was the word used for them, as the government covered all their expenses. In return, they were to teach or work in government offices after they finished their studies. Judge Jose Abad Santos, Francisco Benitez and Dr. Honoria Sison were some of the successful Filipino scholars. Volunteer American soldiers were the first teachers of the Filipinos. Building classrooms wherever they were assigned was part of their mission. In June 1901 these pioneer teachers stopped teaching when a group of teachers from the U.S. came to the country aboard the ship Sheridan. Around August of the same year, 600 more teachers called Thomasites arrived aboard with the ship USS Thomas (from which their name derived); 365 males and 165 females composed the original batch of Thomasites who sailed from the U.S. Around 1902 more American teachers followed the Thomasites, leading to a total of about 1,074 stationed around the Philippines. Many elementary and secondary schools left behind by the Spaniards were recycled and new ones were established in cities and provinces, namely agricultural, business, normal and vocational schools. The following were some of the most important colleges during the American occupation and to this day they still exist: Philippine Normal School in 1901 (now a university), National University (1901), St. Paul University Dumaguete (1904), Zamboanga Normal School in 1904 (now Western Mindanao State University), the University of the Philippines (1908), the University of Manila (1914), Philippine Women's University (1919) and Far Eastern University (1933). While the Philippine Nautical School, the Philippine School of Arts and Trades and the Central Luzon Agriculture School were offering vocational education at that time. As far as remote areas were concerned, such as the Mountain Provinces and some parts of Mindanao like Sulu, schools were also built where attention was given to vocational and health practices. In accordance with the 1935 Constitution, free education in public schools all over the country was provided by the Commonwealth. Nationalism was emphasized in schools – teaching the students about the deceased Filipino heroes. Cooking, farming, sewing and some household activities together with vocational education were given importance. Discipline and proper manners were also not neglected. The Institute of Private Education aimed at observing private schools was established. In the early 1940s the student population around the country studying in the 400 private schools reached 10,000 students. Formal education was not only provided for youngsters, adult education was also present. With the Americans out of the picture, the Japanese Occupation started on 1941. Changes in the system of education were implemented a year later. Embodied in the Military Order No. 2 in 1942 they spelled out the basic principle and guidelines of education in re-opening and operating schools. • To foster love for work. As soon as the Commission of Education, Health and Public Welfare was established, the opening of schools followed in June 1942. On October 14, 1943, the Ministry of Education was sponsored and created by the Japanese government. During their time, the teaching of Tagalog‡, Philippine History and Character Education were observed in schools. Passion for work and dignity of labor was stressed. On February 27, 1945, the Department of Instruction was now under the Department of Public Instruction. Aside from teaching Nippongo and using entirely pro-Japanese books and material at all levels of education, the Japanese also showed movies and organized cultural productions Performers such as singers and dancers were brought to the Philippines together with painters, singers and scholars, so that the Filipinos would acquire inspiration, love, sympathy, and the cooperation among them. Filipinos were keen and did not just blindly believe the excessive promises of the Japanese. Among the three colonizers of the country, the Americans dominate. With English as the medium of instruction, the Philippine education is a prototype of the American system. Schools are categorized into public (government) or private (non-government). The preparatory-primary level consists of nurseries, kindergartens and preparatory schools offered in most private schools; moving on to six years of primary education, followed by four years of secondary education and college – meaning the general pattern of formal education has four stages. Generally, college education takes four, rarely five years and in some cases, as in medical and law schools, as long as eight years. Two or more years are added for graduate schooling or schooling for advanced study, mainly offered to those who have already attained a bachelor’s degree. Classes in the country start in June and end in March the following year. Some colleges follow the two-semester calendar namely: June-October and November-March while other universities, such as De La Salle University, follow a tri-semester pattern. The first term starts in May to August, followed by the second term on September to December and for the third and final term is January to April in the new year. Foreign schools are present with study programs similar to those of the local schools. In 2003, the overall literacy rate was estimated to be 95.9 % for the total population, 96 % for males and 95.8 % for females. The majority (90 %) of all enrolments is in vocational courses with a specific work goal, most of these are in Business and Engineering, attracting over half of the student body (Estelle 1991). While only 4 % of all the students are majoring in Humanities, Mathematics, Natural and Social Sciences – the fundamentals of the arts and science curriculum in most countries.